Ireland’s opposition leader has said the British prime minister appears to have acknowledged she does not have to depend on the backing of the DUP to push through a Brexit deal. Micheal Martin said that Theresa May “may realise” her Brexit proposals will not get the support of the DUP. The Fianna Fail leader slammed the DUP’s position on the Brexit negotiations as “damaging”, and said it was not in the best interests of the people of Northern Ireland. Speaking in Brussels, Mr Martin added: “There is an opportunity for Northern Ireland to get the best of both worlds, and I think the DUP should focus on that. When probed further on this, he added: “Her speech is indicative of perhaps a realisation that she may not be in a position to have to depend on the DUP on this Brexit issue, but I imagine she will want to take people with her in the British parliament. He added that he believes Northern Ireland could get the best of both worlds from a trade deal with the EU and the rest of the UK. 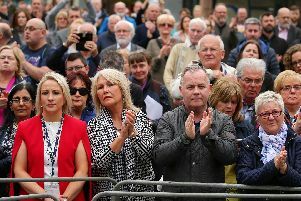 “The pity is that political unionism hasn’t focused on that side of it, and unfortunately the constitutional issues in the North seem to have trumped the bread and butter issues,” he added. Referring to reports that EU chief negotiator Michel Barnier is open to extending the UK’s Brexit period, Mr Martin said that it could give Britain some “breathing space”. He went on to describe it as an “interesting proposal”. “Time could be a factor and a helpful factor in terms of the various parties to this question. I think time in terms of British politics is an important factor. He added that a longer transitional year would allow the British government more time to think through the Brexit issues. Mr Martin is in Brussels where he is meeting with a number of prime ministers and four EU Commissioners from the pro-European group, Alde. He will outline the Irish position and will tell them that the Irish parliament is united on the core principals surrounding Brexit.